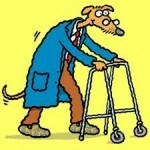 Ov er 70% of dogs develop osteoarthritis in their Golden Years. This most often affects the knees, hips or spine ,causing lameness and weakness from muscle loss. Pets may have difficulty standing up or sitting down. They may be reluctant to jump on furniture or in the car. They may lie around more and play less. While most owners are aware that these are common signs of age- or injury- related arthritis, most owners are NOT aware that these same symptoms can be signs of HEART DISEASE, especially in large breed dogs (the same dogs likely to get hip and knee arthritis)! Large breed dogs, especially Standard Poodles, Portugese Water Dogs and Others are susceptible to Cardi/omyopathy. When this disease is slowly progressive, organs and muscles are slowly starved of oxygen and blood nutrients. * This causes deterioration and weakness of muscles farther from the heart (the rear limbs). It is easy to assume that the dog “just has arthritis”. Veterinarians can even be deceived since the signs of cardiomyopathy can be very subtle. The heart can sound normal to a stethescope, initially. However, an EKG may detect arrhythmias (abnormal heart electrical conduction). A skilled veterinarian can detect femoral pulse weakness– but this is very subjective and based on individual experience, skill and talent. Radiographs of your dogs’ rear limbs and (especially lower) spine can be taken to determine whether his / her lameness or weakness is due to arthritis. If she has such severe arthritis that she has trouble standing up or has lost muscle mass, the arthritic changes should be apparent on radiographs. If there are no arthritis changes, ask your veterinarian for a Cardiac Work Up. Treating underlying heart disease will not only help your pet feel better and be more active, it will help him live longer! Demand Arthritis Screening Radiographs to be sure your dog has arthritis, rather than another condition, before committing your dog to years of arthritis/ pain medication that won’t help your pet feel better (and will make your wallet ache with the waste of dollars).